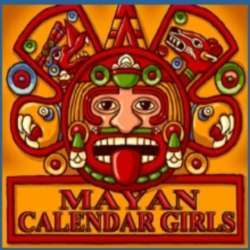 Click on Red text to navigate to sites of interest regarding the Calendar and Mayan mythology. A lovely introductory site and includes some nice touches like "Send a Mayan Birthday Card". Their date calculator ("Daily Tzolk'in") is truly beautiful. This bilingual site from the Maya World Study Center in Merida, Yucatan. is informative and wacko-free, but for an academic site accomodates fun very well. You can get a nice cartoon of a priest and stele with today's date in gylphs. There's a bookstore with some fantastic offerings and an interesting section on Mayan mathematics. But far be it from the likes of Team 2012 to exclude wackos. Here's a fairly tame introduction into the mystical, "we're all mayans", side of the 20012 brouhaha. Tip of the iceberg: you can google up people who are storing ammunition and gold (against the END OF TIME????!! ), new-agers treking to Chichen Itza in 2012 to help affect the paradigm shift (apparently this powerful ancient native prophesy needs the help of gringo white boys to succeed), and the internet equivalent of wild-eyed sidewalk sandwich board Jeremiahs. Hey, it's all in the stew. This site is a very good explanation of the Calander, with many interesting links. But the cool feature is the calculator that allows you to generate Mayan dates from whatever Gregrorian date you type in: your birthday, for instance. Extremely fun and interesting engine which renders the Tzolkin Galactic Tone and Day Sign for any Gregorian date clicked. Some glossaries of Mayan words and phrases--and a very clever dictionary of the glyphs. Images of the Mayan world, past and present, arranged by region. Hard to figure out if this is serious devotion to Pakal the Great (The King Tut of Mayan Archeology), apo-wackos, or what. Whatever it is, it's fascinating: a compendium of scripture/poetry, 2001 ephemera, and things like a scholarly essay on Christ's last words on the cross being in Mayan. Yes, you can bring home the T-Shirt. Some maniacs have put up an online store offering shirts, bags, bumper stickers with Mayan Ascension art.